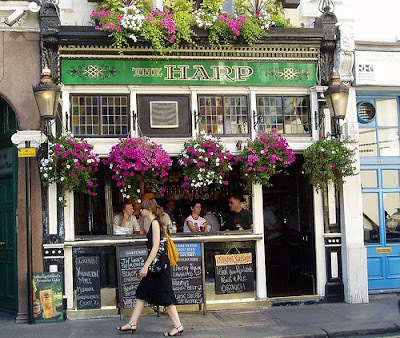 Pubs in the heart of London's Touristland have always been a bit hit-and-miss, but the Harp, in Covent Garden, is a real gem. It's a genuine, characterful pub, with a great range of ales and other drinks. Last time your author visited they even had a Uley Bitter, from the South Cotswolds, on tap, which your author can assure readers is a mark of quality. Given the great range and excellent atmosphere of the place, it's a popular spot with members of the Campaign for Real Ale, and they travel from all over the country to enjoy the Harp's hospitality, and it has won numerous accolades from local beer groups. Given the location, the downstairs bar is almost always busy but the upstairs room is usually a little quieter, and there's a smoking space in the alleyway behind the pub. If you need something to eat the friendly bar staff can also offer you a fine sausage bap, made with finest O'Hagan's Sausages, the winner of the Britain's "Best Sausage Maker" Award.